From a battlefield to a water body and an organic market, this area has many a tale to tell. Visit City Market; experience the smell, sound and sights of a myriad things along with a colourful tale the place has been etched with. ​Walk along the chaos of an Indian market, Unhurried. Russell Market in Shivajinagar is perhaps the most photographed bazaar in the city. What is perhaps less known is that the area is also a shoppers' delight. Walk with us to discover and explore the heritage stories, the colourful ware, the hidden bylanes and snack in iconic bakeries to rejuvenate the tired limbs. Fresh produce, vibrant bazaars and their numerous crisscross lanes, a medley of exotic and native fruits and vegetables on display, coupled with century old tales - this trail is a mix of both the young and the old markets of Bangalore. The twin markets are strikingly different and this contrast can be clearly seen as we walk amidst the chaos of the bazaars. The trail covers the charming KR Market and the Upmarket, Russel Market. While the City Market rose from being a water body to a battlefield and finally to a market, the Russell Market came up as a bazaar for the Europeans and was the place for exotic vegetables, fruits and meat. ​Today each market has a character of its own. 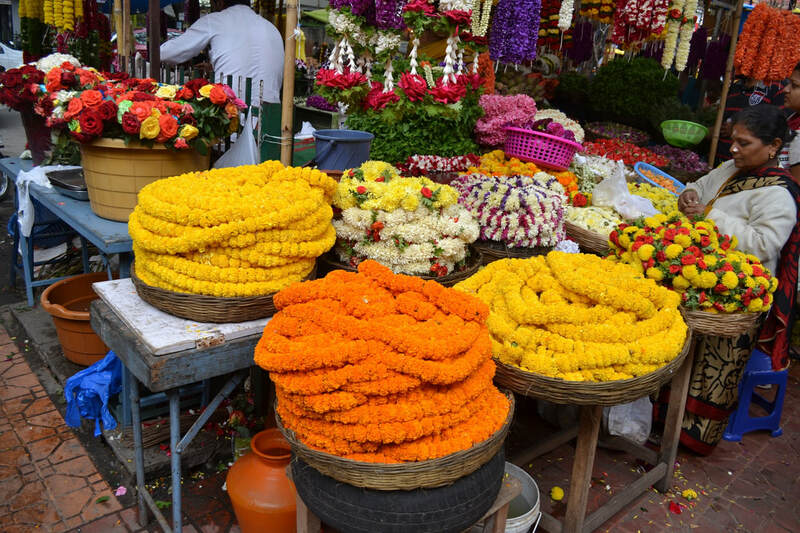 The flower market of the City is very famous with mounds of orange and yellow marigolds, sevanthiges, jasmines etc. Russell Market is famous for its dates, fresh fruits and vegetables. But these are just the icing to the cake. There's much more to explore in and around these markets. Explore with us, the main markets, the various wares, the hidden bylanes, the local eateries, Unhurried.